Before or after the event, talk with a coach or athlete about what it is like to participate in the sport. OR Find out more about the sport and share what you have learned with your den or family members before or after the event. With your parent, guardian, or other caring adult, go for a walk outside, and pick out two or more sights or sounds of "nature" around you. Discuss with your partner or den. Take a 1-foot hike. Make a list of the living things you find on your 1-foot hike. Discuss these plants or animals with your parent, guardian, other caring adult, or with your den. Point out two different kinds of birds that live in your area. With your parent, guardian, or other caring adult, or with your den, find out more about one of these birds. Be helpful to nature by planting a plant, shrub, or tree. Learn more about the needs and growth of the item you have planted. With your parent, guardian, or other caring adult, or with your den, talk about what it means to be part of a team. List some of the teams you are on (den, pack, family, class, etc. ), and explain how you can help each one. With your parent, guardian, or other caring adult, or with your den, find out about good food choices and not-so-good choices. Identify three foods that you think would be good choices and three foods that would not be good choices. Explain the importance of hand washing before a meal and cleanup after a meal. Then show how you would do each. With your parent, guardian, or other caring adult, name and collect the Cub Scout Six Essentials you need for a hike. Tell your den leader what you would need to add to your list to prepare for rain. Visit a nature center, zoo, or another outside place with your family or den. 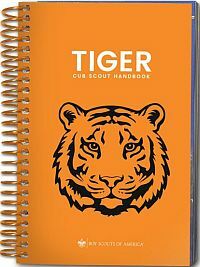 Learn more about two animals, and write down two interesting things about them in your Tiger handbook.